One feature of many Toyota 4x4s are the factory-applied stripe kits. My '85 SR-5 had the bronze stripes on the hood and sides. Over time, the top layer of the stripe begins to crack and peel off from exposure to the elements. After one trip to the car wash, I noticed a few places where the high pressure washer had stripped off the stripe. I used an electric heat gun, on the low setting, to soften the upper layer. I had best results starting at a corner, heating it enough to slip a soft scraper underneath to lift the corner, then slowly pulling back on the corner while simultaneously applying heat the the area in front of the lifted layer. You want to get it hot enough to loosen the adhesive but not too hot to cook the adhesive into the paint, below. If you get the rythmn down, you can often peel the entire sticker off in one piece. If it does tear, try starting over at another corner or edge, it is easier to get a new bite there. Next, you need to tackle the adhesive. I first tried heating and scraping it off. This will take of the bulk of the goo, but leaves a baked on layer to deal with. Also, I found that the paint, when heated, got soft enough to get scratches even from a wooden scraper. Next, I tried 3M Adhevise Remover (can in picture, above). It is very liquid and I found it worked best if left in contact with the adhesive for several minutes. As the hood is not flat and the sides are vertical, this is difficult to say the least. I had to keep applying it with a rag until the goo softened enough to scrape it up. If you take a break, the remover will evaporate and you get to start over again! You can see the results in the picture, above. The lower strip segments show the before stage, next is a segment with the top layer partiall removed, the next two are untouched adhesive layers and the upper two segments show the remnants of adhesive being removed with the 3M product. The above picture represents 1-2 hours of work as I recall, and I wasn't even 1/2 way through! I decided to try and find a better way. I heard that 3M makes an adhesive stripping disk that you can use in an electric drill. I could not locate one of these at the time so looked for something at hand to finish the job. I had purchased a citrus-based paint stripper for another project,c alled Citrus-Strip. I found it was not a very good paint stripper for the heavy paint buildup I was using it on, but thought I might give it a try here. It is an orange colored gel and I applied it to the first stripe I had been cleaning with the adhesive remover. Amazingly as I was wiping it on, the adhesive remnants we lifting right off. Then I tried it on the untouched adhesive and after a few seconds, it would just lift off with a soft plastic scraper. I finished the rest of the stripes in a few minutes. I did find that if I left the stripper on for more than a few seconds, it would start to soften the underlying paint. After wiping it and the residue off the paint, I followed up with the Adhesive Remover to clean off any traces from the paint, then left it to dry in the sun. On my white paint, I saw no visible color change in the area that were under the stripes for 13 years. There was a difference in shine with the paint that had been exposed to the elements. I found on the hood, a fe w places where the underlying paint had bubbled up. I think this was probably from when the previous owner had overheated the engine, as the bubbling was worst right where the hood is closet to the engine. 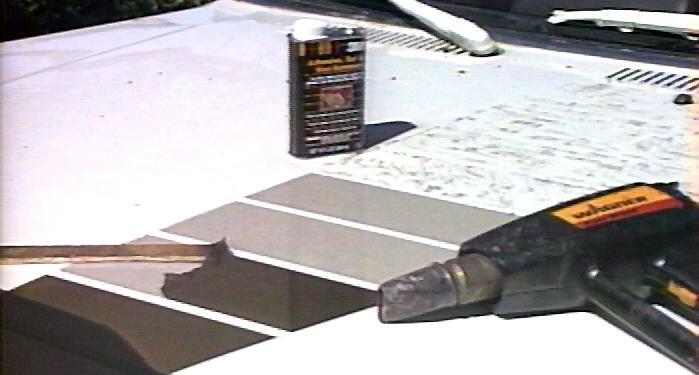 There is apparently an adhesive remover that 3M makes that is like a big rubber eraser you chuck up in a drill. It spins and pulls up the adhesive residue without damaging the paint below. I've not tried this but have heard from several folks that have.